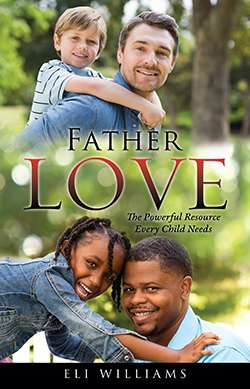 The Father Love program is a personal study and instructor facilitated 13-week program based on the book written by Eli Williams. the objective of the program is to encourage and enable fathers to become better Protectors, Order keepers, Providers, and Stabilizers (POPS) of their families. There is a growing systemic problem in America: the need for a father in a child's life. According to the U.S. Census Bureau, 24 million children in America -- one out of three -- live without their biological father in the home. Consequently, there is a "father factor" in nearly all the societal ills facing America today. The Father Love program provides a way of understanding the cause and providing a solution to growing the number of responsible fathers. The thirteen-week sessions inspire and enable fathers to reach their full potential as POPS. 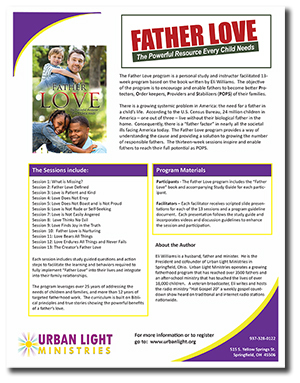 The Father Love program includes the "Father Love" book and accompanying Study Guide for each participant. Each facilitator receives scripted slide presentations for each of the 13 Sessions and a program guideline document. Each presentation follows the study guide and incorporates videos and discussion guidelines to enhance the session and participation. Session 1: What is Missing? Eli Williams is a husband, father and minister. He is the President and co-founder of Urban Light Ministries in Springfield, Ohio. Urban Light Ministries operates a growing fatherhood program that has reached over 3500 fathers and an after-school ministry that has touched the lives of over18,000 children. A veteran broadcaster, Eli writes and hosts the radio ministry “Hot Gospel 20” a weekly gospel countdown show heard on traditional and internet radio stations nationwide.